We are located in the heart of Saskatchewan Canada. The closest big center to us is Humboldt, but we are closer to the village of Annaheim. We purchased our acreage in 2016 and it has become our home. We have acquired a number of animals that include our horses, dairy goats, sheep, chickens, rabbits, cats, dogs, Dexter Cows and soon we will be adding pigs. 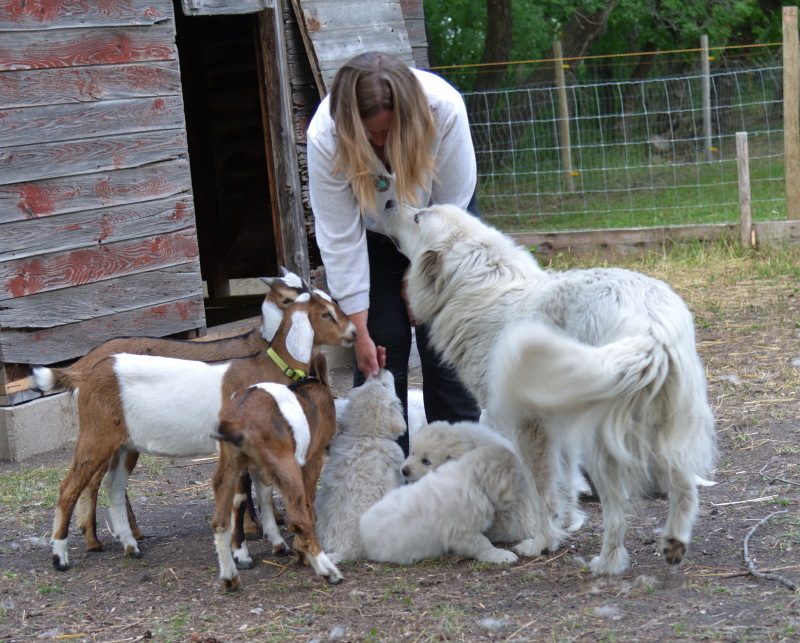 We wanted protection for our livestock from the many predators that roam the area which include but is not limited to wolves, coyotes, cougars, foxes, skunks, and raccoons and the Maremma was the best suited Livestock Guardian Dog for us. 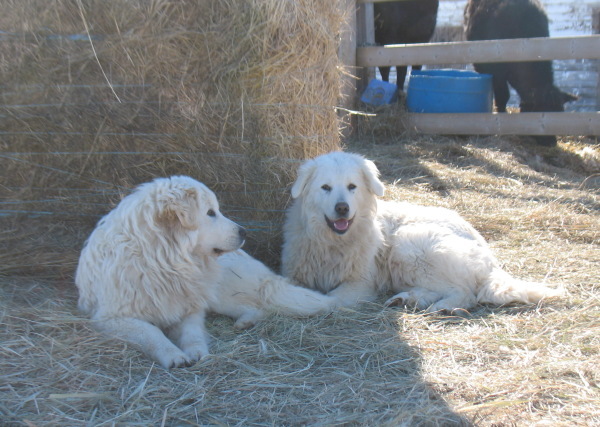 The Maremma is a friendly and well-balanced Livestock Guardian. They are sober and dignified, loyal, brave and determined dogs without the need to constantly bark. They are friendly and affectionate, yet independent. They were bred to be thinkers and fallow their natural instincts when it comes to guarding their flock. They will not necessarily follow your every command but with calm, firm, confident and consistent leadership toward the dog, they will listen. They are very intelligent and a successful partnership with your dog requires a level of mutual respect in handling and the tone of your voice. They get along with other dogs and pets very well. They have very good instincts when it comes to people and they may be slightly reserved with strangers but not always and people who are not welcome on your property or in your pasture will be stopped in their tracks. The Maremma is a little smaller than its fellow flock guardians but has just as much endurance and strength. They are alert and guard their flock with dedication and have control over their pasture. Maremmas have a much smaller roaming area than other guardian breeds and they are more content to stay with their flock. These dogs will defend their flock or house and master with their life, and they are very attentive to children. The Maremma is a marvelous sheepdog and loves its work. It is a terrible enemy of the wolf and other predators but is loyal and loves attention from its human partner. They are held in high esteem by shepherds, especially in the mountains where they thrive in the snow and are resistant to both cold and brambles. Our search for a Maremma led us to RLT Farms in Spirit River Alberta and we purchased our first two Maremma female pups. RLT farms imported both of their sir and Dam from Italy. We are very happy with these two girls and in the spring of 2017 we decided to add a breeding male and that search led us to Peavine Hollow Farms in Virginia, U.S. and we had him imported to Canada at the tender age of eight weeks. He is a fourth Generation male from their breeding program and one of their last as they have retired. To date, we have not lost any animals to predators. The spring of 2018 we had our first two litters of pups, both of which were born in the pasture with the sheep and goats. The mothers were relaxed and had no problem with their pups being around the livestock, and Nicolo, our male has matured and relaxed so much since the puppies have arrived and he is very good at training them. ​having more than one Livestock Guardian Dog in large predator areas is vital. A single dog cannot be expected to successfully confront a pack of wolves, or even a pack of coyotes, nor bears and mountain lions. A one-on-one confrontation brings a high probability of injury to a single dog. Throw in one additional predator and the dog is out-numbered - throw in a pack, and the dog has no chance. In large predator areas, 2 or more Livestock Guardian Dogs (depending on the number and composition of the predator load) is recommended. A study done in Alberta over a number of years proved that cougars would challenge two Livestock Guardian Dogs but not three. Some people make the mistake of thinking one dog is all they need to protect their livestock - while this may be true if the predators are smaller or few (the occasional coyote or fox, etc), it is not the case when dealing with larger predators, especially a group of large predators. We have also learned that the dogs and livestock alike are at ease when there is a sufficient number of dogs to manage the heard and predator load. We agree with and follow the European standard of the breed and our females will only have one litter per year and we did not breed until the girls were two years old. We are still getting established and expanding our pastures and livestock herds. She has a very sweet personality and loves her cuddle time and has a very laid back personality yet fierce when provoked. She excels with the newborn livestock and is very bonded to the herd in her pasture and protects them with her life. And is a full sister to Lexi. Lexi is a full sister to Sheena and has a very watchful eye and keen personality. Nothing goes unnoticed. Combine that with her calm and easy temperament with the livestock it makes her an exceptional guardian and she is devoted to the herd she protects and can move her from one pasture to another to look after another herd and she adapts instantly. She is one of our breeding females. Sheena and Lexi's Dam and Sire were both imported to Canada from Italy and there are many champions in their bloodline. You can find them listed on the pedigree page. Bred by; Kristina Lawwill of Peavine Hollow Farms, Free Union, Virginia U.S.
We imported Nicolo' to Canada when he was eight weeks old. He is one of Peavine Hollow Farms fourth generation Maremmas and one of their last as they have retired. When we got him he started his training under both Lexi and Sheena and finished under Lexi. Today he switches back and forth between pastures and works well with either of the females. He has proven to be an asset to the livestock he guards and they rely on him. He is exceptional when it comes to training his pups. Penny will be staying with us as a special tribute to my Mother who spent her last year living with us here at Whispering Aspen Ridge. "a Penny from Heaven That an Angel sent to me"
Penny will be an upcoming Dam in our breeding program.